Among Oracle database professionals, MySQL is being considered more and more. 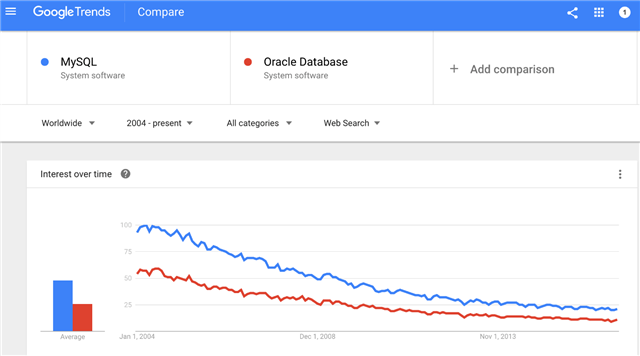 And now, there is data that shows that MySQL is about to overtake Oracle to take the spot as the number-one database. Because the free and fairly powerful MySQL database is the basis of millions of LAMP (Linux-Apache-MySQL-PHP) web applications, it has always showed up more often than Oracle Database in simple comparisons like Google Trends, which gauges interest based on the popularity of search terms over time. A more detailed analysis takes in more data, such as the number of search engine results, discussions on Q&A sites like Stack Overflow, job offers on portals like Indeed.com, mentions in LinkedIn profiles, tweets, and many more. 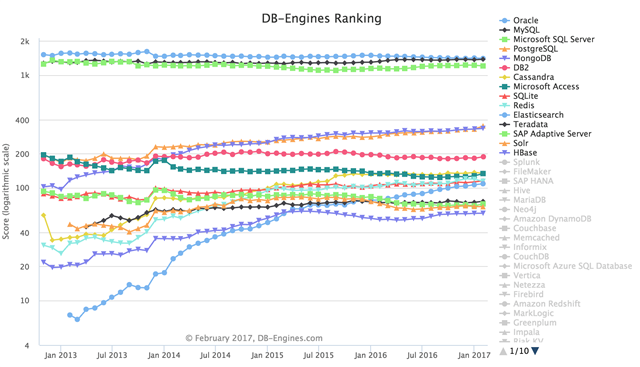 DB-engines.com calculates one of these detailed rankings, and has consistently shown Oracle, MySQL, and Microsoft SQL Server as the top three databases. Note that the scale is logarithmic, so the top three are way higher than the rest. The start of the drop coincides with Oracle's decision to stop selling their attractive Standard Edition One license in December 2015. All of the small and medium systems that used to choose an Oracle database by default are now looking to MySQL, which offers enough features and performance for 95% of all database applications. If you are a developer, you need to consider whether to choose an expensive Oracle database by default for new projects. If you are an Oracle DBA, it’s a good idea to learn to manage MySQL databases. Sten Vesterli is an Oracle ACE Director and works as lead developer, consultant and trainer specializing in Oracle tools and servers. He is the author of a book called "Oracle ADF Enterprise Application Development—Made Simple," published by Packt Publishing.